The plan was, I was going to make Rudolph nose cookies (on a stick) for all of my munchkins when they were here at Thanksgiving, take a photo, post it here, and maybe even make it into a Christmas card. That was the plan, but somehow when everyone converges on my home, many of my well-laid plans fly out the proverbial window. Of course I remembered my idea after 6/8 of the munchkins returned to Texas and Nevada:( Sigh. I used a sugar cookie dough, rolled it out, grabbed a small (1.5-inch) biscuit cutter and went to town cutting out reindeer noses. 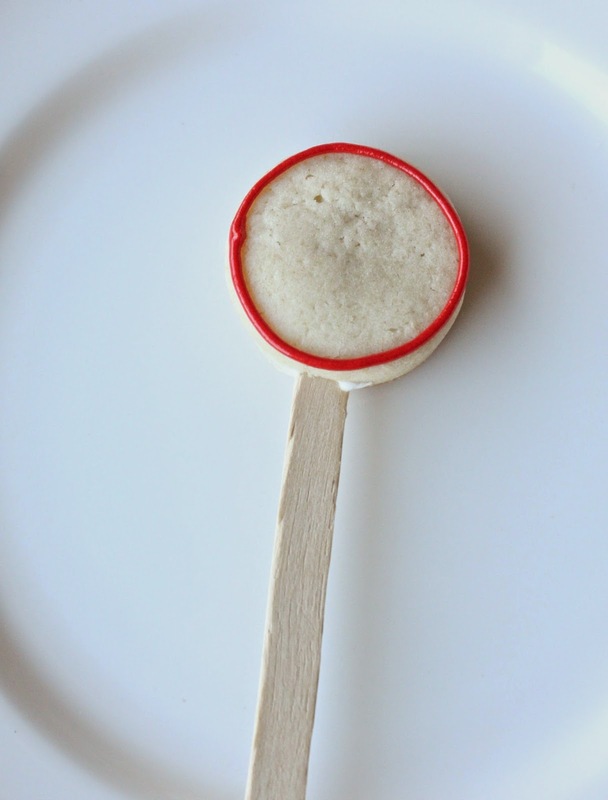 I then inserted popsicle sticks and baked them. When cooled, they were iced using red (AmeriColor Super Red soft gel food paste) tinted royal icing. While the icing was still wet I sprinkled on red decorating sugar. Let dry completely. 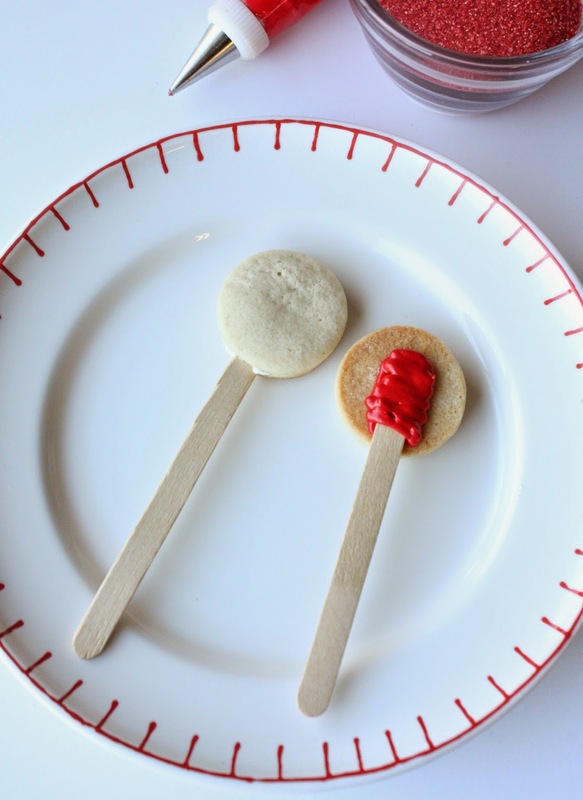 The cookie on the left was baked with the stick inserted, but some bakers prefer to add the stick by attaching it with royal icing after it's baked. It's up to you. 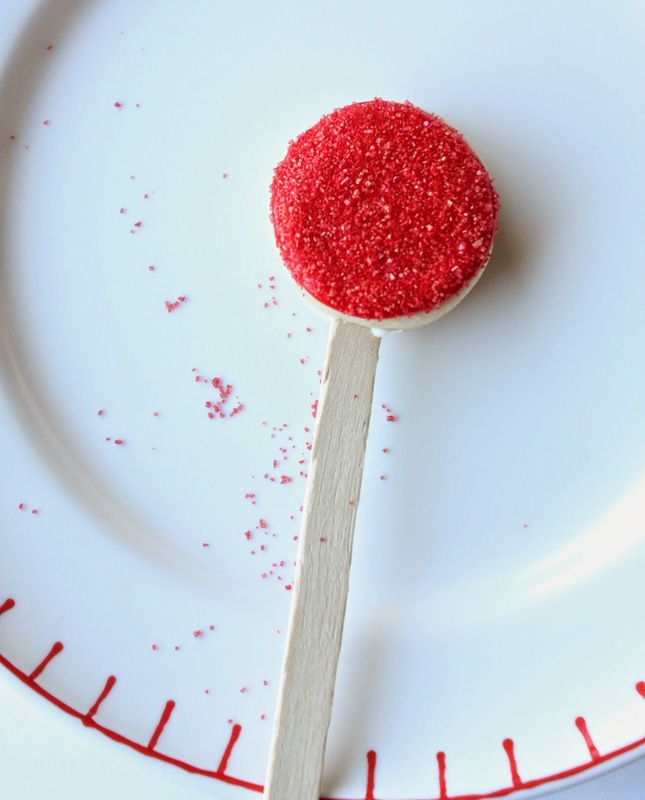 Fill a decorating bag with the red royal icing, fitted with a #2 or#3 decorating tip. Outline the cookie with the icing. 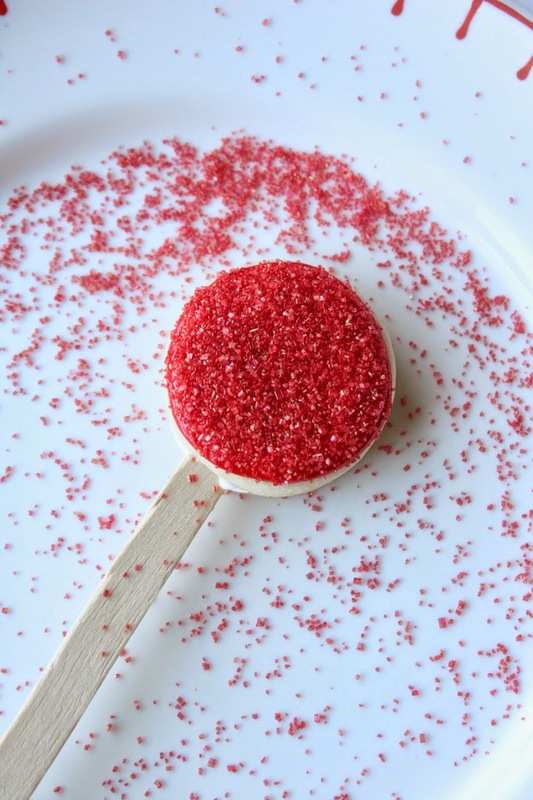 Immediately sprinkle red sanding sugar, liberally, over the cookie. Shake off the excess sugar and save it for later. Reindeer noses, all ready for the little ones (or big ones, for that matter, haha)! 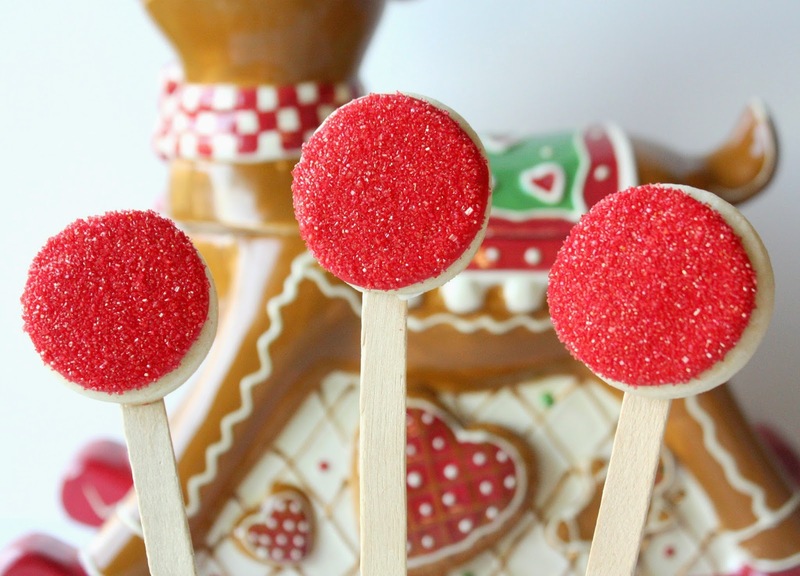 How cute would these Rudolph Nose cookies on-a-stick be for a party favor or photo-op? As you can see, very cute! So cute and so smart! ^^ I'm going to try this for our Christmas party, soon. Or maybe I should just test it out for the family now! Your recipes and ideas are so amazing. This is so much cuter than the trendy mustache on a stick photo op. LOVE it! leave to YOU to have a wonderful idea like this! so cute and fun...sweet memories! This is such a cute photo. I bet your Munchkin loved posing for it. These are sooo cute. I bet your Munchkins love you to pieces! Adorable... I was hoping this was coming after your noses-in-a-jar :) ! so very cute! i still can't believe you have 8 grandkids! I am making these this morning for our church craft fair!! I think the kids would LOVE these...THANKS!! I love this idea - we are definitely making these! So adorable! It was the 'red nose day' yesterday over here in Germany. Those would be really perfect for the event. Ahhhhh!!! I LOVE THESE....Expect to see a pic of my munchkins as Rudolph soon!!! adorable! I saw this on Pinterest and didn't realize they were yours! Sometimes the best ideas are the simplest :) Merry Christmas! Love-love-love~! The red-nose cookies are the cutest thing!! !And it's so simple!!! BTW did you pre-soaked the sticks before baking? I love this! I wanted to let you know that I featured this in my "What I Bookmarked This Week" post - stop by and see. That little munchkin behind the nose is a sweetheart! Love that you put the Rudoph noses on a stick too. How lucky that you got one of the munchkins to pose with it! Such an adorable photo. These cookies are so cute! I would love it if you came to link to my holiday recipe swap blog hop. It is my first ever! Love these recipes. back to tell you they sold out lickety split at the craft fair. THEY WERE SO POPULAR!! The kids (and adults) just loved the idea, so thanks so so so much!! These cookies and your munchkin are so adorable. Sorry about the plan. Hey, maybe save the idea for next year. 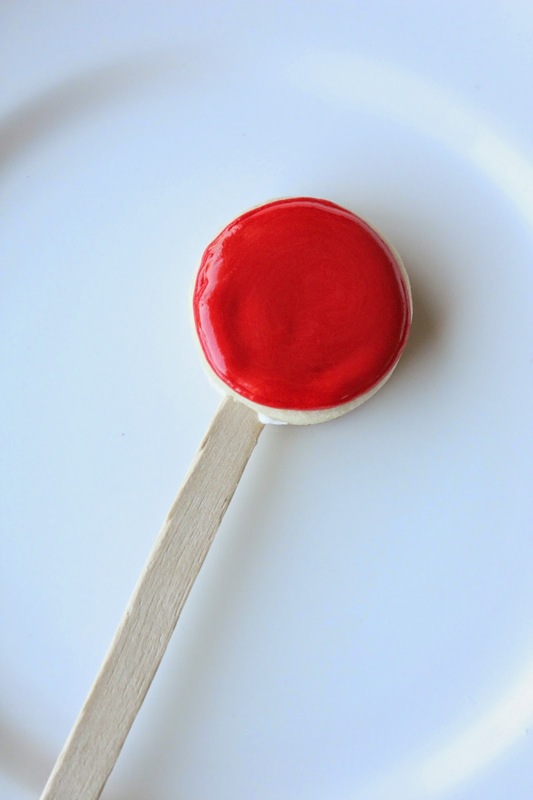 :) I really want to see all your munchkins with a red nose. Wish you and your loved ones a wonderful Holiday Season. I know my son would love these little treats! First time at your blog, you have some beautiful recipes here! This is so cute!! And the picture of your son is DARLING!! I am your newest follower. I'd love for you to follow me back, if you want to =-) I would love for you to come link up at my TGIF LInky Party - http://livinglifeintentionally.blogspot.com/search/label/Linkey%20Parties - I know my readers would love to see! !